Thrushes are one of our 'old favorite' birds. In appearance they are attractive though probably not as splendid as some birds, especially warblers. They are comfortable and familiar, and always pleasant to see. In song it's nearly impossible to beat them but that is another story. We often see a lot of Veerys in Shenandoah National Park. And it seems, though I could be wrong, that we see fewer and fewer Wood Thrushes there each year. By contrast here in Philadelphia we're fortunate to have a nearby woods that is always full of Wood Thrushes in breeding season. 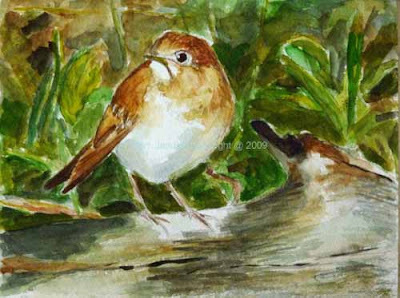 The Veery above was a young bird, seen in Shenandoah National Park in May, 2009. Some of my very first watercolors when I took up watercolor about three years ago were also of Veerys seen and photographed in Shenandoah. I'm happy to say that I have made progress, at least in the Veerys themselves. The background has improved a bit, but it's still pretty impressionistic. What struck us about this bird when we saw it was the very minimal breast-streaking. Though Veerys always look somewhat innocent he seemed more that way than most. I'm pretty sure that was due to the lack of streaking and paler, younger face. The photo above was the first version. After I took a photo of it and looked at it more closely I realized it was completely missing the warm rusty wash that colored the young Veery. He looked far too cold. I also didn't like the stark light/dark contrast on the log on which he stood. As I've said many, many times here I always tend to use up the valuable white of watercolor paper much too quickly. Then I'm stuck with a dark, less than vibrant, less than fresh watercolor. In this case I probably saved too much. So in the final version at top I toned down the contrast quite a bit and used up more of the white of the paper. This last photo is just a preliminary sketch that I did from the photo before beginning the actual watercolor. It's mainly just a warmup exercise and an attempt to place the subject on the paper. You can see a darker area in the wings, where I needed to do some reworking to get them properly positioned. I also used it to test out some of the colors that I planned to use on the actual painting. 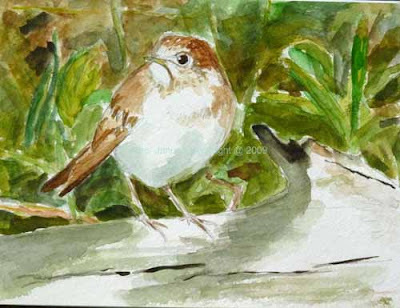 So what is it that makes this Veery a 'Limberlost' Veery? That's easy. We saw him on the Limberlost trail at Shenandoah. This used to be one of our favorite trails, full of very old, and very large Hemlocks. But Wooly Adelgids have killed off all of those old trees. They were saved more than one hundred years ago from the lumber mills by a owner with some environmental foresight. But that couldn't save them from invasive pests. Though all the literature suggests that hemlock loving birds like Blackburnian Warblers and Acadian Flycatchers are common there we haven't seen any in years. Blue-headed Vireos are still plentiful but it seems like birds of pioneer forests are more likely. The Chestnut-Sided Warbler is plentiful. In any case we saw this handsome young Veery on this trail. That gave me the opportunity to say a little bit about the history of Limberlost and its wonderful hemlocks. Because we've been on vacation a lot recently we've missed seeing much of the spring migration locally. With that in mind we headed to Carpenter's Woods in Philadelphia this morning. But it was extremely quiet. About the only surprise, outside of the missing migrating warblers, was one Baltimore Oriole that landed about 6 feet from us very low to the ground. But we also seemed to sit ourselves down on a bench that must have been very near to an Acadian Flycatcher nest. We had one or more Acadian Flycatchers flying around very close to us. That gave me a chance to take another look and notice how much browner the wings of this bird are compared to his back, which is much more olive. When we returned home I went back to work on the watercolor above and added some olive wash. You can also see that I fiddled quite a bit with the background. In a sketch like this you have the choice to either render the background in detail or to improvise the 'impression' of a background. 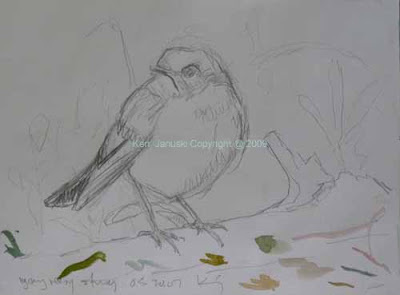 Since the bird is the foremost concern I, and many other bird artists, often use 'impressionistic' backgrounds. Sometimes they work; sometimes they do not. When they do not it's too late to change course and go back to a detailed background. I'm not completely happy with the background here. But I do think that any more 'fiddling' will just lead to a dead painting. So unless this watercolor develops an itch that must be scratched it is done. I seem to go back and forth with watercolor between,one, being somewhat more expressive and less limited by what I actually see and, two, trying to be more accurate. As in all art the desire for accuracy can also lead to overcaution, tentativeness, etc. 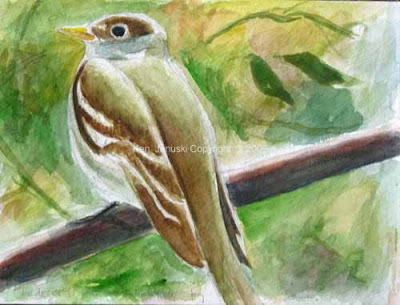 Today's watercolor of an Acadian Flycatcher that I saw and photographed in Shenandoah National Park a couple of weeks ago tends towards more accuracy and maybe more tentativeness. That was not the problem a year ago when I photographed another Acadian Flycatcher in almost the exact same spot. He was so far away that the photo just showed the slightest hint of shape and posture. So with that photo I concentrated more on the overall composition of the pastel drawing. 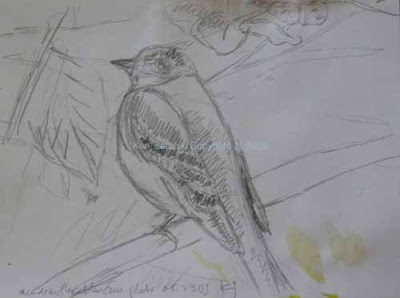 The Flycatcher was a very small part of the drawing though it still was the focus. (Someone might legitimately ask: well if it was in the same place why did you get such a better, more detailed photo this year? The answer is a new camera: Lumix Panasonic FZ28. It has an 18x optical zoom compared to 10x of my last Lumix. I'm not a camera person and don't have the time, money or inclination to carry a lot of camera gear. But these Lumix cameras with fairly high optical zooms with Leica lenses fit my purposes well. And..... are in my limited price range). I'm not sure what stage I'm at with this new watercolor. I thought I might be done but after photographing it the watercolor does not seem finished. I did try to stay true to the beautifully gradated colors of the Flycatcher, though they are really a bit more olive than this shows at the moment. I'm afraid any more work on it may ruin it through overwork, which may have been a problem in the last couple of watercolors I did. So as I'm say I'm 'waltzing around watercolor', waiting to see what I should do next. I'll probably know tomorrow or the next day after having let this sit for a bit. The drawing above is a preliminary sketch for this watercolor. It's nothing special but I thought some readers might find it informative. In it I'm just trying to get a general sense of where I want the bird placed in the watercolor. It ended up being pretty close to this though I did move it up just a bit. Two recent blogs on Irises, Cool Blue at The Spicebush Log, and The Art of the Iris at Madsilence, were fresh in my mind as I watered my new tomato transplants this morning. Both blogs were about Irises, both cultivated and wild, and reminded me of the beauty of flowers as well as their source as inspirations for artists. 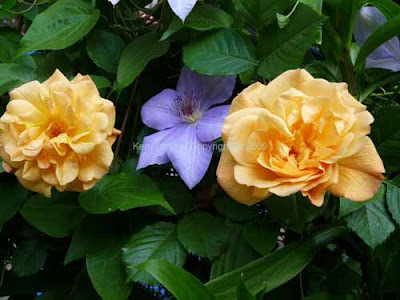 When I looked up from my watering I saw the first open blooms on our 'Autumn Sunset' rose, nestled between some Ramona clematis, which have been open for awhile. Given time I'd try a watercolor. Given no time as today a photo was called for. As I took the photo I couldn't help but admire the nearby flower bud stalks of 'Henry's Garnet' Virginia Sweetspire waving around the open flowers our our unnamed Rhododendron. As I speculated on Madsilence's blog I have to wonder how many artists got their first inspiration as children from moments such as this. 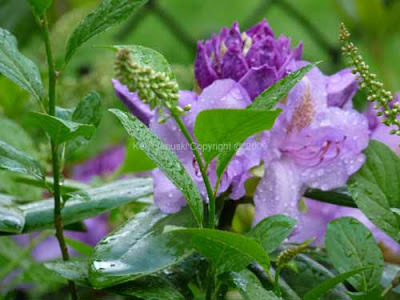 Madsilence has a quote from Claude Monet which says 'I perhaps owe having become a painter to flowers.' You do have to wonder. How many artists first saw pure color, and light, in flowers? Speaking of color in art I see that the Obamas have borrowed a fabulous Richard Diebenkorn Berkeley series painting from the National Gallery of Art for the White House. I've always liked Obama but this shows he has incredibly good taste as well! 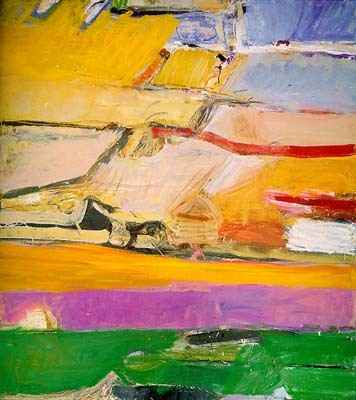 I'm very partial to Diebenkorn, having discovered him while living in California through most of the 1970s, and before he'd become quite as famous as he is today. At that time he seemed like a living embodiment of the love of color in painting, a rightful successor to Matisse. A few weeks ago I wrote about our 4-5 days at Cape May and the extraordinary variety and number of birds that are there. We saw nearly 100 different birds. For us that is a very high number, especially as we never count birds where we don't get a very clear, definitive view. Recently we also spent about a week in Shenandoah National Park. There we saw a little over 50 different birds. Which was more enjoyable? There is no doubt that it was the Shenandoah experience. I can't deny the enjoyment I get in seeing new birds and adding to a count, for a day, a year, a vacation, or for the ultimate count, The World Series of Birding, which took place at Cape May last weekend. It's a pleasant combination of sport and nature. Because we often stay for 5 days or more in Shenandoah, and always in the same place, we get to know the birds. 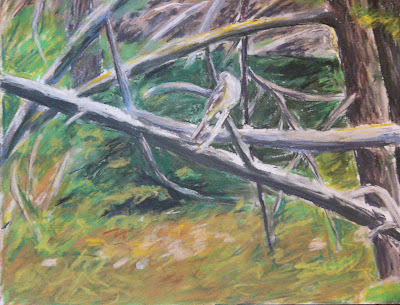 Last year I did a pastel of an Acadian Flycatcher whose photo I took at a certain spot on the South River trail. This spring we saw another Acadian at almost the exact same spot. I find something enjoyable in finding a bird in the same location. Perhaps it's the same bird. Perhaps it's just the perfect habitat for this species. In either case this type of birding is more than just birding. It's also about ecology, about understanding and enjoying a bird in its world. Our time in Shenandoah is always full of experiences like this. In this watercolor I've made the background darker than it really was. This is called 'artistic improvisation.' If you lose the original brightness just do your best to still get a good paintng. That's what I've done here. I did intend to do some work from life on this trip. In fact I had some new watercolor brushes and paper sent in a rush shipment so I'd get them in time. Maybe that guaranteed I'd never use them.......:-(. More likely it was just that the birds moved too quickly. So once again I've brought back a large collection of digital photos that will eventually make their way into paintings and drawings. But all the while I knew that I was missing something that only working from life can gain. So I still intend to do more work from life soon. This trip was a rich one, so I'm sure that both writings and artwork based on it will soon find its way into this blog. Many months ago I wrote about some of my drawings being used in a film. 'APeacockFeatheredBlue' debuted about a month ago and was recently in the Atlanta Film Festival. I wish I could have been at the filming and felt more a part of it. But I couldn't so it was with great anticipation that I received a copy of the film a few weeks ago. It was quite enjoyable both to see the short film and to see my own drawings in it. A trailer for the film can be found here. If you look at it you'll see Marcel, the young hero of the film, working on a drawing that I began, at two points in the film. In another section you'll see his mother ripping down two of my drawings from the wall. They are supposed to be Marcel's and are indicative of his problem: spending too much time on art and not enough on his other subjects, particularly science. In the rest of the film he uses his creativity and imagination to try to win the school science fair prize. I've been a little reluctant to show any of my older, abstract work here because this is primarily a blog about my new work and nature. Since almost all of my recent work is about nature the two fit together nicely. But I also wanted to mention this film, and of course I'm proud of my older abstract work. So the debut of the film seems like a good excuse for including a very abbreviated artistic biography and perhaps showing how my abstract and representational art connect. It actually was drawings like the one at the top that convinced me I could make the switch from 20 years of abstract work to representational work about four or five years ago. I had spent a number of years drawing insects under a microscope and they can be seen at my main web site. 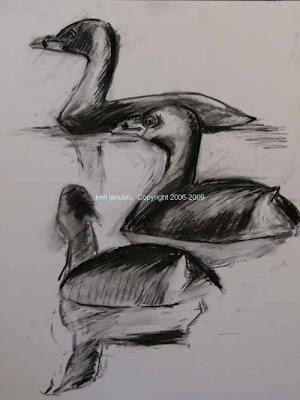 But I hadn't done any of birds and no representational or naturalistic paintings of any type. So it was still a huge jump to doing naturalistic work of the same ambition as my abstract work. As anyone who reads this blog regularly knows I frequently lament my uncomfortableness with watercolor. But that is not the case with charcoal. The drawing at top was done during a period of almost 10 years where I did abstract charcoal drawings about 8 hours a day, every day. Charcoal drawing is in my blood. So I thought that I might be able to use that knowledge and ability on drawings of birds. The first attempt, of an immature Black-crowned Night Heron, was clumsy but it gave me the confidence to continue. The Pied-billed Grebes, above, is also a relatively early attempt. I was satisfied enough with the results that I've not looked back. Soon after I'd done a few charcoal drawings of birds I decided to try watercolor. I'd only done a few watercolors as a student at Berkeley, but I remembered liking the medium. 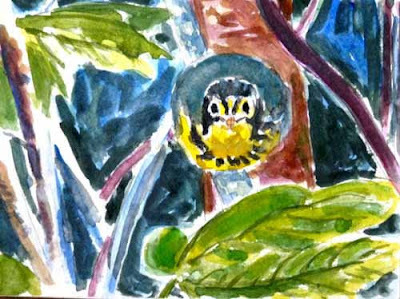 I think I was also inspired by many of the watercolors of birds in John Busby's 'Drawing Birds.' I'm nowhere near as ambitious in my naturalistic work as I've been with abstract work but I think that's more a matter of having enough time than anything else. I hope you'll continue to see better results here. But there is another small part to this story. How did I come up with all of these abstract shapes? Why was I so enamored of shape? Like most artists I've done art since I was a child, including abstract or non-objective art. I remember admiring Wassily Kandinsky as a youth. But my youthful abstractions were largely geometric. Where did all the organic shapes come from? For that you have figure drawing to thank. I was living in San Francisco working at a very dull job in order to pay the bills. I had moved to San Francisco from Chicago and while there discovered that I really wanted to pursue my childhood ambition of being an artist. But how was I to go from a vague ambition to something real? Well it included study at City College of San Francisco, and later at University of California at Berkeley. 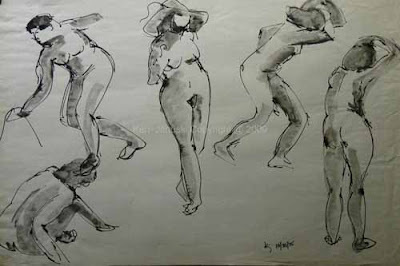 But in between, every night after work I'd go to a three-hour figure drawing class sponsored by San Francisco Adult Education. I probably spent two years doing this (the drawing above is an example that I still have). And in doing so I think really trained my hand and eye to draw the shapes I saw. 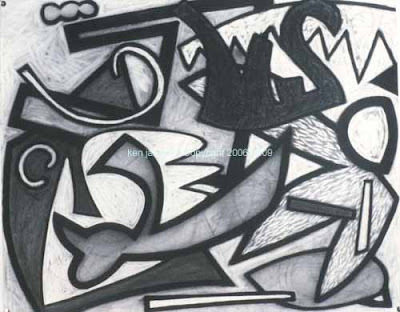 Did this directly translate to the shapes of my abstract work or to my ability to draw the shapes of birds now? I really don't know. But I think the most likely answer is that it all came from here. So there you have it: a short artistic bio. And a theme: from nature, to abstraction, and back to nature again. AND a film debut! P.S. Speaking of biographies I did want to mention this new one by an author whose River Landing blog I follow. It's a short blog entry about how the author came to find his lifework in the natural sciences. I found it very enjoyable as I have with all of his writings. Please don't take this as gospel truth. 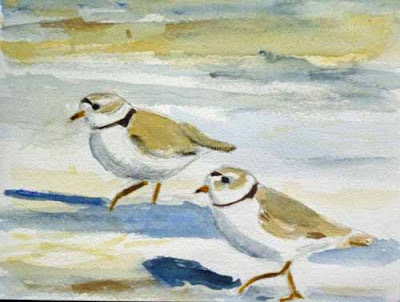 The figure 1 of 1600 refers to the number of pairs of Piping Plovers on the East Coast of the U.S. It was a rough figure given to us by a field biologist at 'The Meadows' of The Nature Conservancy in Cape May, NJ. Further research online found an estimate of less than 2000 nesting pairs in 2008. Wikipedia says the total world population in 2003 was about 6410. So I don't know a hard and fast figure. 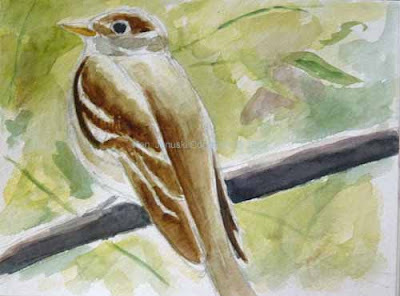 Nonetheless I hope my point is clear: in this small watercolor you are looking at only one of 1600 such bird pairs in existence on the East Coast and two out of a total population of 6410. They are rare, threatened, and special. How often can you look at something whose existence is so severely threatened? What should be done about it? I won't go on about the ethics of this. I try to avoid such big questions on this blog. So all I will say is that I think it is a great mistake to let any species disappear, especially through neglect. In talking to the biologist last week I and my wife expected that we would find that the greatest threat to the newborn plover chicks would be human. But that's not the case. Here Laughing Gulls and even Ghost Crabs are greater predators. Nature is complex and things aren't always what they seem. In terms of overall threat to all Piping Plovers I'm sure that loss of beach habitat is at or near the top. Because Piping Plovers are almost impossible to see when they are not moving we were very fortunate to find them running around all over the beach like windup toys on our first day at Cape May last week. Photos taken then were the basis of the quick watercolor at the top. The next day we were out with a birding group and it was almost impossible to find the birds because most of the time they were sitting still. They are a tremendous example of protective coloration. If humans can't see them then neither can many of their predators. If the Piping Plovers are an example of 1 in 1600 Heislerville Wildlife Management Area showed the opposite, let's say 1600 of 1600 shorebirds in flight all at the same time. When we first arrived at Matt's Landing at Heislerville last week we saw a number of shorebirds standing in shallow water amidst thousands of small brown, rounded rocks. It was only when I focused my scope on the 'rocks' that I realized that they were birds! Almost all of them were dunlins. 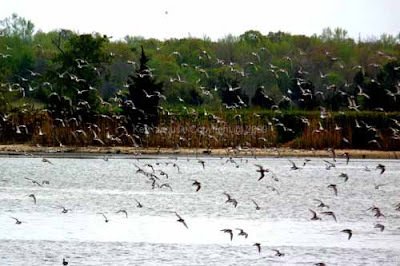 When the shorebirds fly, as in the photo above, they create the equivalent of an optical illusion. There is an explosion of flickering movement, light and shadow. It is really an extraordinary experience. More extraordinary, on a less visceral level, is the knowledge that here, in contrast to the Piping Plovers, you are experiencing nature's profusion. Though again this is misleading. I'm not an expert on shorebirds. In fact I'm pretty new to them. But my guess is that the birds seen here, dunlins, short-billed dowitchers, black-bellied plovers, semi-palmated plovers, semi-palmated sanderlings and greater yellowlegs are also in decline. So unfortunately the sense of profusion is somewhat false. There is no denying the number of birds seen. And it is thrilling to see them, as they stop briefly here on their way to the Arctic tundra to breed. But they are far fewer than they were in the past. Still it was a tremendous sight to see. One of the extraordinary aspects of Cape May, NJ for birders is that there are so many different birds in different habitats. So although I've talked mainly about shorebirds in this post, we also saw warblers, other passerines, hawks, ducks and other birds in great numbers. This is good and bad. The good is the experience of nature's profusion. The bad is the realization that forces such as geography funnel birds to the Cape May area so that you see an abnormal representation of the bird population. But my feeling, like most others I imagine, is to be thankful that we can take advantage of it. For anybody who does wish to bird the Cape May area I'd highly recommend 'Birds and Birding at Cape May' by Clay and Pat Sutton. And if you're there don't miss the walks given by the Cape May Bird Observatory. As a woman we directed to the CMBO walk at Heislerville told us afterwards: "That was the best six dollars I ever spent!" I brought along my art materials but didn't have time to do anything but take photos. So I'm sure I'll be posting a lot of new work based on them. But I also intend to make a greater effort to do more work from life. One thing that hit me as I looked through all the photographs I took is that, though I liked many of them, even the ones I liked looked like, well......., photographs! They do not look like what I saw. For that there's art!